At the opening general session of the Alltech Symposium a big award is given. This year it was presented to one of Alltech’s own. 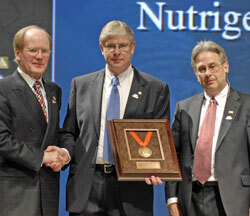 It’s the Alltech BioScience Medal of Excellence. Dr. Ronan Power, Phd, Director of Research, Alltech, is the Director of their new Nutrigenomics Center. He’s seen here receiving his award (center) with Alltech President, Dr. Pearse Lyons to the left and Dr. Karl Dawson, Alltech Director of Worldwide Research to the right.